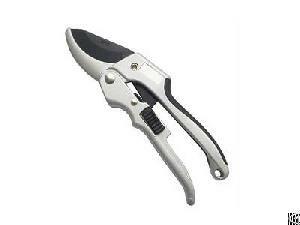 Design Roll Hand Pruner has non-stick coating Blade. With non-stick coating, the cutting performance is smooth and easier. The Roll System on blade is 50% Effort Saving. The cutting capacity is up to 1". Handle is attached with anti-slip SOFT TPR grips for comfortable use. Special Design is for the "Removable Oil-soaked Sponge" Wipe the blade with oil to keep the blade anti-rustiness. Another patent is the "Plastic liner" on lower anvil. It's for Clean Cut! Patented in : many countries.